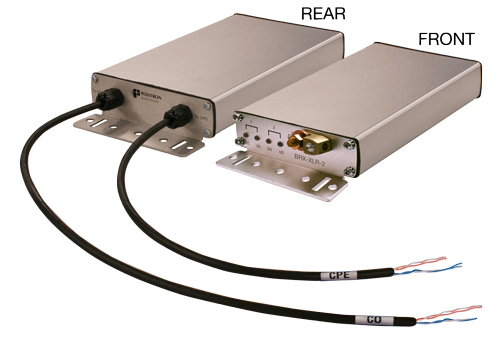 The Broadband Reach Extender – Extra Long Reach (BRX-XLR) is a fully integrated solution that extends the reach of deployed ADSL / ADSL2+ DSLAMs or MSANs to deliver 10 Mbps per pair to subscribers at 17,000 feet (5.2 km) on 24 AWG (0.51 mm) copper pairs. It is being used for a multitude of applications and it is particularly well suited in underserved or unserved markets. An increase in the available bandwidth capacity on existing last mile infrastructure results in higher ARPU, lower attrition and increased customer satisfaction. The bandwidth improvement ratio increases progressively on longer loops. 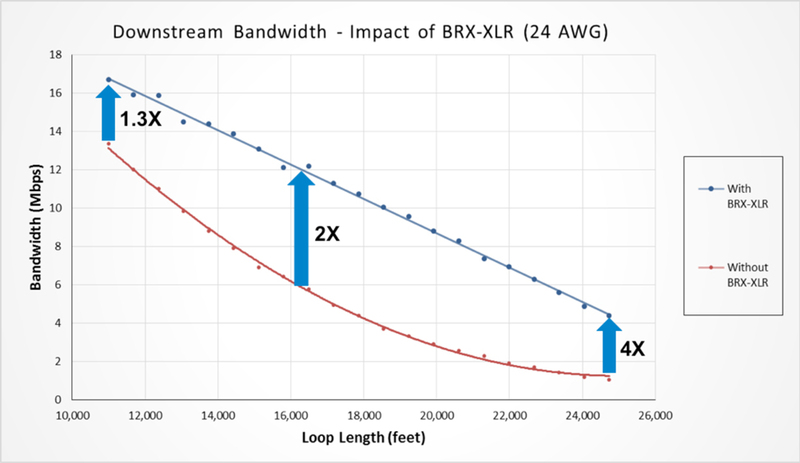 For example at 16 kft the BRX-XLR will improve the bandwidth by 2 times, and at 25 kft the BRX-XLR will improve the bandwidth by more than 4 times. 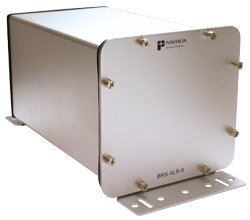 The BRX-XLR facilitates the use of a multi-pair enclosure or cabinet to provide target bandwidth at various distances in a large serving area. There are no minimum distance limitations on the L2 segment and full coverage is provided in the existing and extended serving area. The BRX-XLR is designed to fit seamlessly in the copper OSP. It is offered in various form factors including a self-contained 1-pair and 2-pair enclosures and flexible 24 or 48 pair enclosures for higher-density areas. 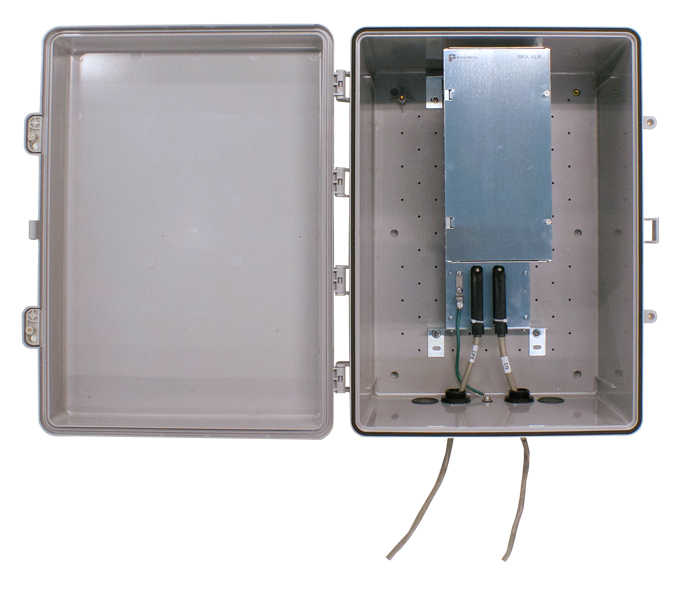 These solutions come in a variety of weather resistant enclosures (IP-65) or in flexible enclosures designed to seamlessly fit in most pedestal and cabinets used by operators. They can also be easily mounted on a pole or on the outside of an existing cabinet. 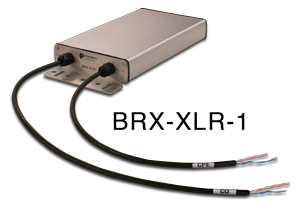 The BRX-XLR-1 is a single pair unit ideal to serve isolated users. The BRX-XLR-2 is a 2-pair unit that can serve two different customers or a single customer when bonding 2 pairs together for higher bandwidth. The BRX-XLR-1 and BRX-XLR-2 share the same enclosure and come with embedded gas tube protection for lightning protection. The enclosure is designed for easy installation on a pole, inside or on the outside of a pedestal or on a wall. An optional strand mounting bracket is also available. The BRX-XLR-24 holds 12 BRX-XLR 2-pair modules (with primary lightning protection) for a total of 24 ports / copper pairs. The BRX-XLR-24 comes with a pair of standard 25-pin Amphenol connectors (24 pairs) from the CO/DSLAM and 24 pairs toward the subscriber CPE devices. It includes an optimal pole-mount bracket. The BRX-XLR-24-1S incorporates a BRX-XLR-24-S factory installed in an Emerson CAD-12 pedestal to serve up to 24 ADSL / ADSL2+ subscribers in a customer service area (CSA) with enough room to handle a 100-pair binder from the Central Office (CO or Exchange) and a 100-pair binder toward the subscriber CPE devices. 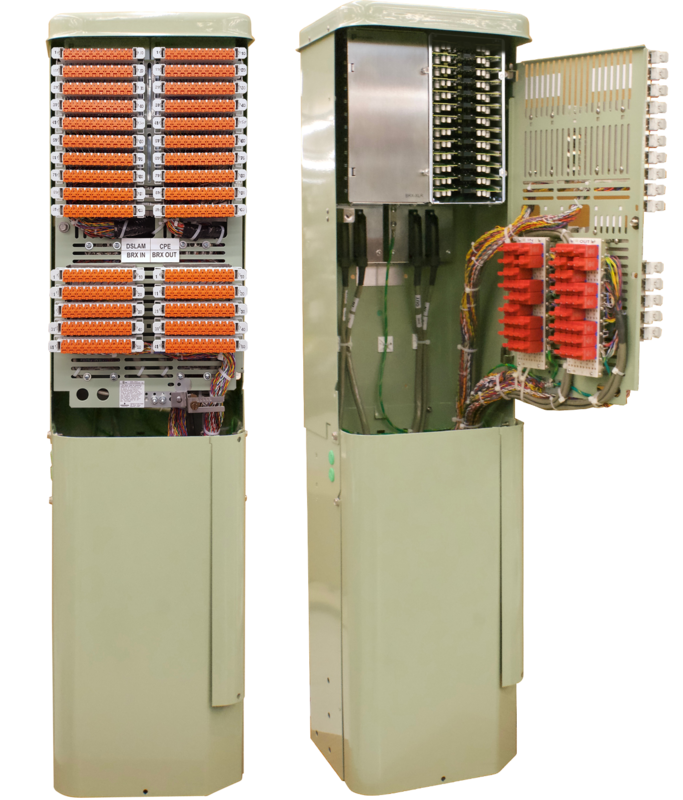 The BRX-XLR-48-1S incorporates two BRX-XLR-CAB-24-S factory installed in an Emerson CAD-12 pedestal to serve up to 48 ADSL / ADSL2+ subscribers in a customer service area (CSA) with enough room to handle a 100-pair binder from the Central Office (CO or Exchange) and a 100-pair binder toward the subscribers. The achievable bandwidth based on the location of the BRX-XLR (from the DSLAM) and the distance to the subscriber CPE. The optimal bandwidth for a specific total loop length and gauge of wire and recommend the location where the BRX-XLR should be installed (usually a range of distances from the DSLAM) to achieve the target bandwidth. The best placement of a BRX-XLR cabinet to achieve a target bandwidth to multiple subscribers over a total loop length. 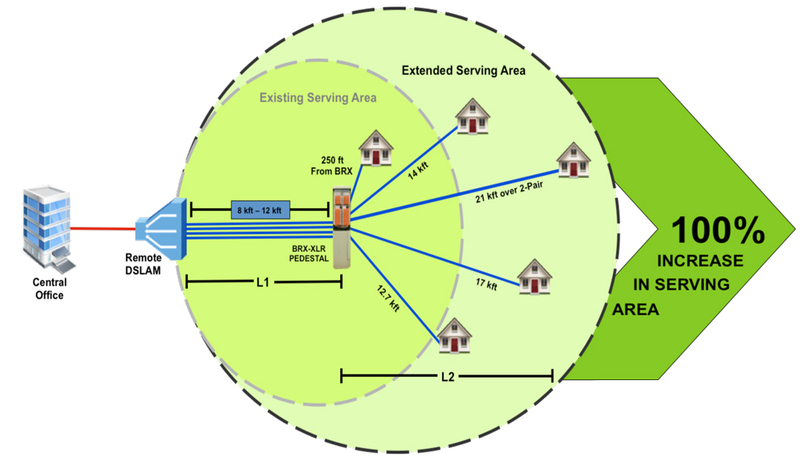 This is useful to determine the Customer Serving Area (CSA) for a given access speed tier. 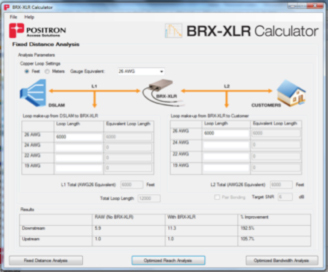 The BRX-XLR calculator in available in through our Portal (registration is required to access the Portal).